Shimmer Jenny | Light Your Nails! You know I love glitter gradients, I think they are a quick way to cover a chipped mani when you have no time to do a whole new one. My favourite glitters so far are the ones by Shimmer Polish and today I’m gonna show you two different gradients where I used Shimmer Jenny. First one has a base of Mia Make-Up n. 52 Azure. I’ve already told you about that one and mentioned formula wasn’t easy and didn’t self level. I decided to cover the bald spots using Shimmer Jenny. The different colours in Jenny were a perfect match to the delicate colour of Mia Make-up Azure. In the second pic I added a matte top coat, I love how the coloured glitters pop up even more when I mattify them! Sapete che adoro le cascate di glitter, penso che siano il modo perfetto di coprire una manicure non più perfetta, magari quando non si ha tempo per ridare lo smalto. I miei glitter preferiti di sempre sono quelli del brand indie californiano Shimmer e oggi vi mostro due nail art dove ho usato Shimmer Jenny. La prima ha una base di Mia Make-Up n. 52 Azure. Vi ho già parlato di questo smalto e della difficoltà di stesura. Ho quindi deciso di coprire le sue pecche con Shimmer Jenny. I glitter di vari colori di Jenny sono la combinazione perfetta per Mia Make-up Azure! Nella seconda foto ho aggiunto un top coat matte, che secondo me fa risaltare ancora di più i colori di questo glitter. Second time I used Shimmer Jenny was on top of F.U.N. Lacquer Starry Night of the Summer. We had a couple of cloudy days when I was wearing that one so the holo flame was quite invisible. Glitters on the other hand are great during cloudy days because they sparkle no matter what! La seconda volta che ho usato Shimmer Jenny è stata con F.U.N. Lacquer Starry Night of the Summer. Ci sono stati un paio di giorni nuvolosi quando ho indossato il F.U.N. quindi l’effetto olografico era nullo. I glitter invece sono perfetti per i giorni di brutto tempo! Brillano in tutti i casi! Looking back at the photos I could have covered F.U.N. Lacquer Starry Night of the Summer completely with Shimmer Jenny instead of just doing a gradient on the tips. It was a perfect base for it! Which look do you like best? And most important: do you like glitter gradients at all? Riguardando le foto penso che avrei potuto coprire F.U.N. Lacquer Starry Night of the Summer con Shimmer Jenny per tutta l’unghia invece che solo sulle punte. Era una base perfetta. Quale combinazione vi piace di più? Ma soprattutto, vi piacciono le cascate di glitter? Wohh! you said it right...matte version is very eye catchy. Glitter are popping out more on light blue shade. Thanks! Shimmer's have this thing that they look fantastic matte! L'holo sotto gli da una profondità maggiore secondo me! Hai ragione, concordo al 100%! 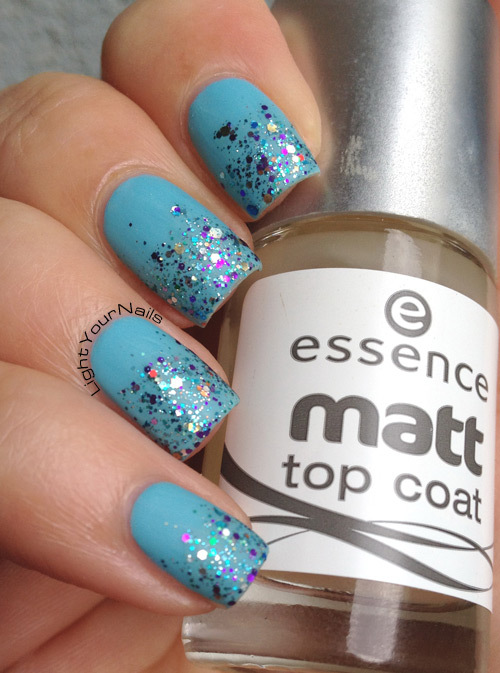 Bellissimo con il top coat opaco! Very pretty and elegant! Way better than every nail all covered! I guess that's a tip from the laziest part of me! When I don't want to do a whole new mani, or have no time to, I find a way to make the older one work! Glitters are the easiest way! That is such a fun glitter! The second manicure is absolutely stunning, I love the polishes that you paired together! Any cloudy day would be the perfect time to! I always love using glitters to cover up bald spots haha it's like secrets of the trade amongst us nail girls. Haha! I am glad I'm not the only one doing it! Both are gorgeous combinations, though I love the first one just a little bit more ;). 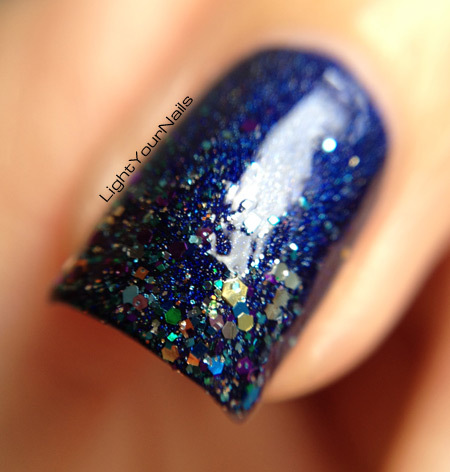 This is such a beautiful glitter polish! Strano ma vero, mi piace! Sarà che i glitter sono proprio dei colori che preferisco! Mi piace moltissimo sull'azzurro, è molto estiva come combinazione!